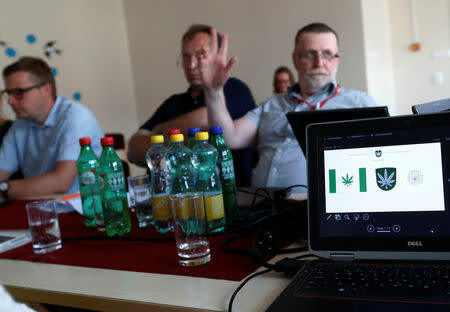 KANEPI, Estonia (Reuters) - A local government in Estonia has narrowly approved using a flag with an image of a cannabis leaf as its symbol after a online poll overwhelmingly voted for it. The name of the region, Kanepi, in southeastern Estonia, is derived from "kanep", the Estonian word for marijuana and the hemp that their ancestors grew and processed into cloth, oil and ropes more than 150 years ago. The need for a new flag came about after several different local government areas merged into the larger Kanepi. An open online poll in January collected more than 12,000 votes for the cannabis symbol, despite the population of the rural district and village of Kanepi being less than 5,000. Nine members of the council then voted for the flag with eight against. Kanepi council member Arno Kakk, who voted against the new symbol, told Reuters after the vote on Tuesday: "I must say that I am not for the fact that we will be marching under this kind of a flag." Council chairman Kaido Koiv, who supported adopting the leaf, said the process "was very democratic", despite questions raised over the numbers involved in the online poll, and saw no reason to reject the symbol. Drugs are illegal to sell in Estonia. Possession and use of small quantities of marijuana for personal use is a misdemeanor punishable with a fine.